A Cessna 208B Grand Caravan, registered P2-SAH and operated by Tropicair, departed Kamusi for Purari River, Papua New Guinea at approximately 13:15 local time on a charter flight under the instrument flight rules (IFR). The aircraft was carrying a pilot and nine passengers. One of the passengers, in the right pilot seat, was a pilot about to begin training with the operator. Takeoff and climb from Kamusi were normal and the pilot levelled off at 9,000 ft above mean sea level and completed the appropriate checklist. Between Kamusi and Purari River the terrain is mostly flat and forest covered with areas of swampland and slow-moving tidal rivers. Habitation is very sparse with occasional small villages on the rivers. The weather was generally good in the area with a cloud base of 3,000 ft and good visibility between build-ups. Approximately two minutes into the cruise there was a loud 'pop' followed by a complete loss of engine power. After configuring the aircraft for best glide speed at 95 knots, the pilot turned the aircraft right towards the coast and rivers and completed the Phase 1 memory recall items for engine failure in flight. He was assisted by the passenger in the right pilot seat, who switched on the Emergency Locator Transmitter (ELT) and began broadcasting 'mayday' on the area frequency. Checking the database in the Global Positioning System (GPS), the pilot found the airstrip at Kibeni on the eastern side of the Palbuna River. Kibeni airstrip is disused, uneven, and short but it was the only open ground in the area on which the pilot could attempt a forced landing. The pilot, assisted by the passenger next to him, tried unsuccessfully to restart the engine. The passenger continued to give position reports and to communicate with other aircraft. At about 3,000 ft AMSL the pilot asked for radio silence on the area frequency so he could concentrate on the approach to Kibeni airstrip, flying a left hand circuit to land in a south westerly direction. He selected full flaps during the final stages of the approach, which arrested the aircraft's rate of descent and caused it to float. The wheels contacted the ground three times but this did not slow the aircraft enough to enable the pilot to stop it before the end of the airstrip. In order to clear the trees between the airstrip and the river, the pilot elected to pull up on the control column. The aircraft became airborne again, damaging the crown of a coconut palm as it passed over the trees between the end of the airstrip and the river. The pilot turned hard left and pushed forward on the control column to avoid stalling the aircraft. He levelled the wings before the aircraft impacted the water. The aircraft came to rest inverted and partially submerged, and immediately filled with water. After a short delay while he gained his bearings under water, the pilot was able to undo his harness and open the left cockpit door. He swam to the surface, opened the door at the rear of the fuselage, and helped the surviving passengers to safety on the river bank. After approximately 20 minutes, villagers arrived in a canoe and transported the pilot and surviving passengers across the river. Pratt & Whitney Canada examined the engine and concluded that the engine power loss was caused by the fracture of one Compressor Turbine (CT) blade in fatigue, which resulted in secondary damage to the remainder of the CT blades and downstream components. The fatigue originated from multiple origins on the pressure side of the blade trailing edge. The root cause for the fatigue initiation could not be determined with certainty. 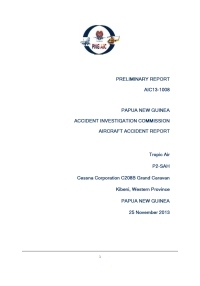 The PNG AIC investigation report did not contain a Probable Cause statement as per ICAO Annex 13. The Accident Investigation Commission recommends that the Civil Aviation Safety Authority of PNG should bring this report to the attention of operators in PNG and reinforce the need for clear concise safety briefing instructions and demonstrations and the need to be ready to assist in the event of an emergency evacuation. Distance from Kamusi Airport to Purari Airstrip as the crow flies is 224 km (140 miles).